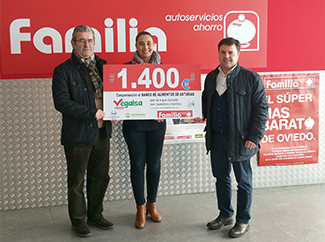 Humana Fundación Pueblo para Pueblo and Vegalsa-Eroski delivered on Wednesday a total financial contribution of 18,435 euros to the Galician social entities ACLAD-Association of Aid to the Drug Addict, Renacer and Hogar Sor Eusebia. The presentation took place at an event held at the Eroski / Center in Acea da Ama (Culleredo-A Coruña), which included, among others, Gabriela González, Director of External Communication, RSC and Vegalsa-Eroski Clients Area, And Gustavo Pampín, from the National Promotion Department of Humana. ACLAD is a non-governmental non-profit organization that seeks to promote the quality of life of people with substance use disorders and / or who are in a situation of social exclusion. Renacer is an entity focused on the fight against drug addiction. The Hogar Sor Eusebia association is a non-profit social initiative whose main objective is to fight against social exclusion. Each entity received € 6,145. 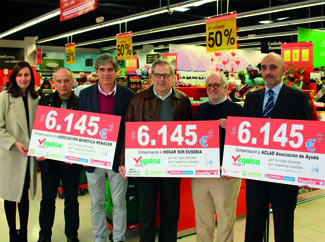 To this amount are added the 1,400 euros delivered last week by Vegalsa-Eroski and Humana to the Food Bank Foundation of Asturias. In both cases the funds generated by the management of the used textile collected in 2016 in the containers installed by Humana in 69 establishments Eroski / Center, Eroski / City and Autoservicios Familia of all Galicia and Asturias. These are two more examples of how, through proper management of the used textile, it is possible to develop local support programs in the municipalities where the Foundation is present, either in direct collaboration with the municipalities or, as in this case, through of a private collaborator like Vegalsa-Eroski. It is a sample of the commitment of Humana reverberating in the citizenship part of the resources generated with the management of used clothes. For example, € 209,402 was allocated to these programs in 2015.